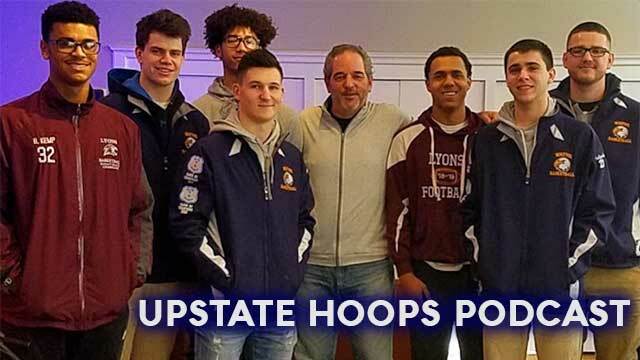 Student-athletes from the top two boys basketball teams in the Wayne-Finger Lakes this season are in-studio to talk about their seasons and the post season ahead on the Upstate Hoops Podcast. From the Lyons Lions, seniors Justice Smith, David Weaver and junior Benji Kemp. From the Wayne Eagles, seniors Logan Blankenberg, Logan Holgado, Billy Thompson and Nick Carmichael. Also, a look at the standings in all the Wayne-Finger Lakes boys and girls leagues along with our spotlight games for the final week of the regular season. Last Saturday night the Lyons Lions defeated Clyde-Savannah in one of the most entertaining high school basketball games this season. Junior guards Justice Smith and David Weaver will be in-studio to talk about thay big win, their season so far and the road ahead as we move closer to Sectionals. Also, a recap of the past week in Wayne-Finger Lakes high school basketball and our updates boys and girls Power Rankings will be revealed.